Here on homify 360°, we are slightly obsessed with beauty, which begs the question: what are the definitive factors that determine when something is beautiful, and when it is not? Obviously one can get very deep and start talking about beauty being in the eye of the beholder, which we agree with, but it doesn’t really answer our question. Is there even an answer? 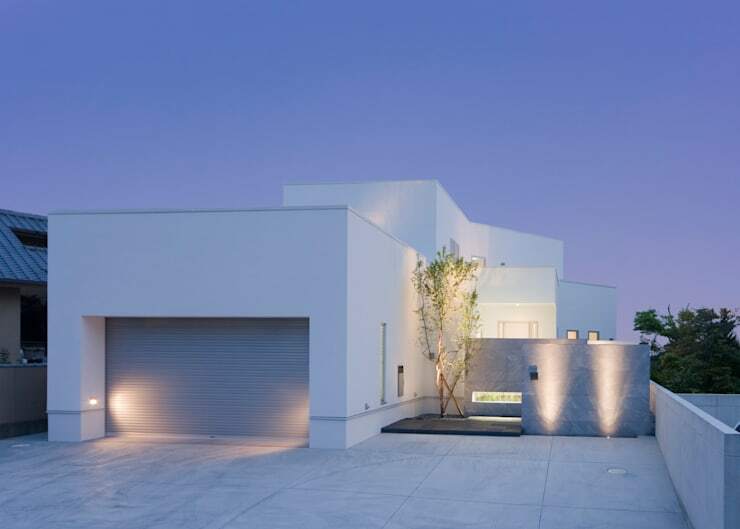 Undoubtedly of the modern design, the houses’ facade flaunts a beautiful combination of straight lines, light neutrals, and simple surfaces – no excessive embellishments here, which is perfection. Oversized concrete tiles adorn the parking area, resulting in a floor surface which blends in remarkably well with the facade’s tranquil colour scheme. We start off with a close-up of the front entrance – or rather the area which leads to the front entrance. 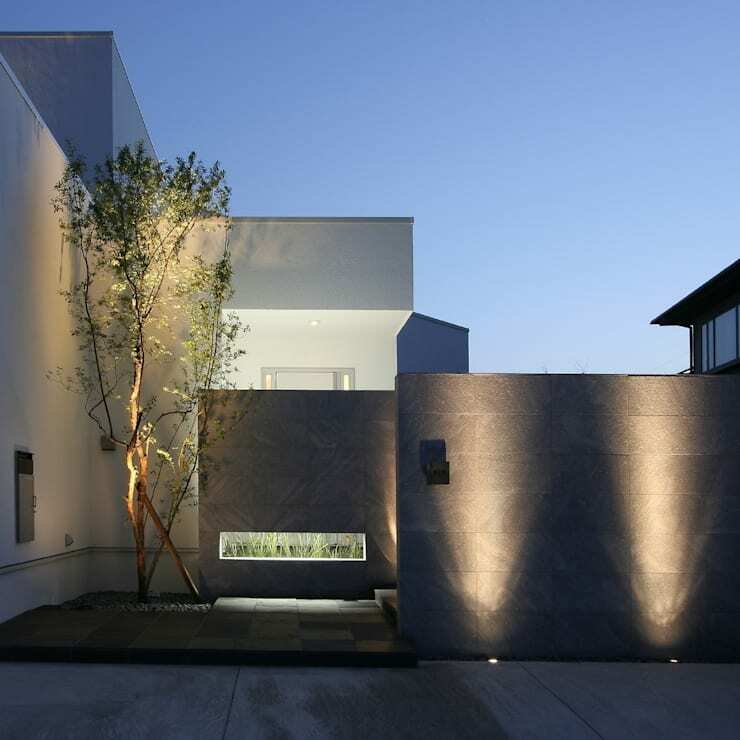 Coated in grey stone which contrasts strikingly with the patch of garden, we see the front wall light up in select spots thanks to the strategically placed exterior lights. Let’s take a step back to admire the whole scene. It’s a vision of magnificent monochrome once we step inside: crisp-white walls and ceilings counteract stylishly with flooring surfaces made up of chocolate-brown timber and charcoal-dark tiles. 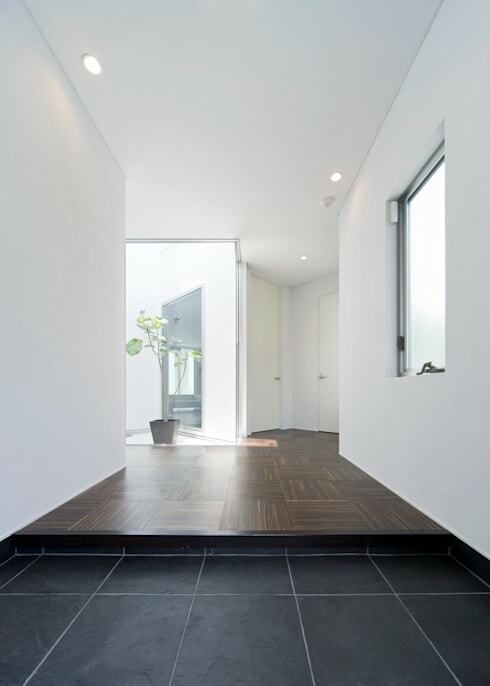 The decorative side of things are kept quite minimalist, resulting in a clean and open entrance area. To make the most of the house’s space, an open-plan design has been opted for. Here we see the living room, kitchen, and dining area beautifully intermingling with one another, linked by the same neutral colour palette and yet slightly divided through means of space and furniture placement. An L-shaped sofa ensures a slim and sleek touch regarding furniture, while an elongated credenza helps with both displaying- and storage purposes. A generous dose of glass allows natural light to seep indoors, making those whites even whiter. 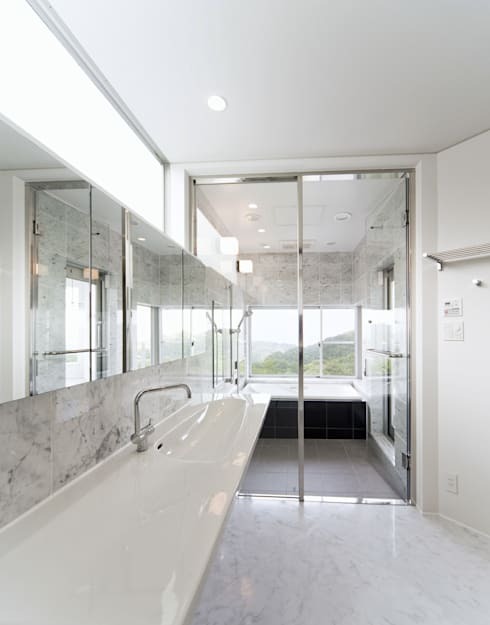 Taking a hint from the facade’s successful colour palette, the bathroom decided to go white as well, albeit with a different choice in materials. Here is where marble, porcelain, and glass rule the stylish scene, making up a very elegant space that one rarely gets to see outside ultra glamorous hotel suites. The stylish results are in: check out which are the: Best Materials for the Bathroom! A stylish little surprise has been added to the open-plan living area: a cinema corner, with setup occurring in mere seconds. 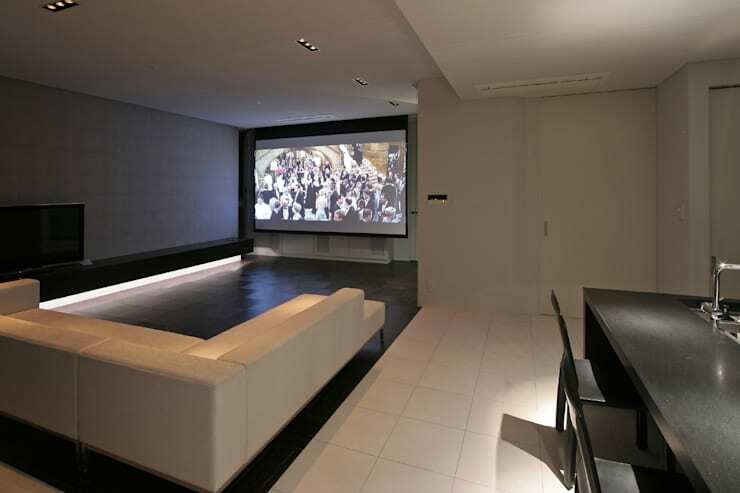 Then it’s merely a choosing of appropriate lighting and having a sit-down on that stylish sofa to enjoy some onscreen entertainment in ultra modern style. So then, would you call this residence ‘beautiful’? Did it tick all the boxes on your list of what it takes for a structure to be labelled ‘stunning’? It sure did on ours!